The purpose was to overcome iodine deficiency among women rural India. Iodine deficiency deficiency is leading to many other health issues among rural woman and the next generations. Though there are iodized salt available in the market and iodine tablets too are available but 'Jeevan Bindi' is far more easy-to-use and game changing. Idoised salt might not be available to all rural areas and it is expensive too in comparison with non-iodine salt and the iodine tablets too have availability problems, dosage problems, when to use and how much to use, etc, in other words without requiring behavioural changes. While the Jeevan Bindi is something which auto-delivers iodine through forehead skin. Users just have to fix it on their forehead for the whole day, just like they do with 'Bindi'. For readers outside India—In India, married woman put this dot called "Bindi" on their forehead. This is generally in red or dark red colour but as a fashion statement this has taken many colours and shapes. The innovative idea was why not use this Bindi to deliver the nutrient. Thanks to Singapore-based Grey Group. 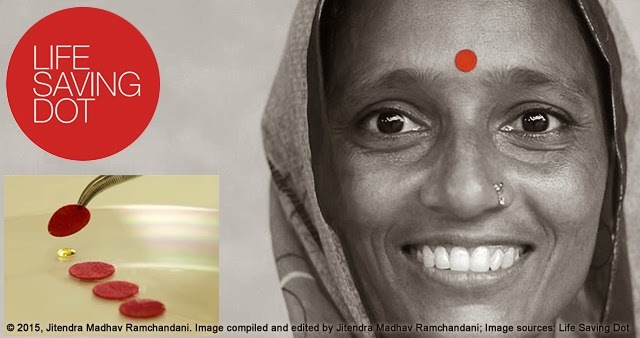 Their newly-formed philanthropic arm, Grey for Good, collaborated with NGO Neelvasant Medical Foundation and Research Center to produce iodine patches in the form of ‘Bindis’, and these iodine filled bindis dispense the daily required dosage of iodine to the wearer, without an additional effort or any behavioral change needed. Such products prove we need more ideas and start-ups in the health industry for game changing results. Auto-driving cars? Apple watches? Tallest buildings? Oh yeah the curvy phones? Chaps, where is the innovation in health and medicines?